wearable accessories to world's top-class companies. Effective cost control solutions We provide cost effective solutions to our customers with strong control of cost in supply chain, product design&process, and manufacturing. Fast prototyping Fast prototyping ensures quick response upon customer's sample build request. Advanced automatic equipment Advanced automatic systems can ensure product's consistency and easy expansion of capacity. Strong expansion capability Scaled economic production lines and strong expansion capability. Reliable laboratory system We have a sound and reliable laboratory system, which is the guarantee of high quality products. Strict quality control process Strict quality control process and advanced measuring/testing machines allow Hochuen to do accurate measurements and multiple testing from raw material to finish goods such as tensile test, salt spray test, ROHS, sustainability test to ensure product high quality and reliability. Confidentiality control Strict information security system is a powerful safeguard for customer's intellectual property of product from development to delivery, we offer a complete confidential process and management for our customers. 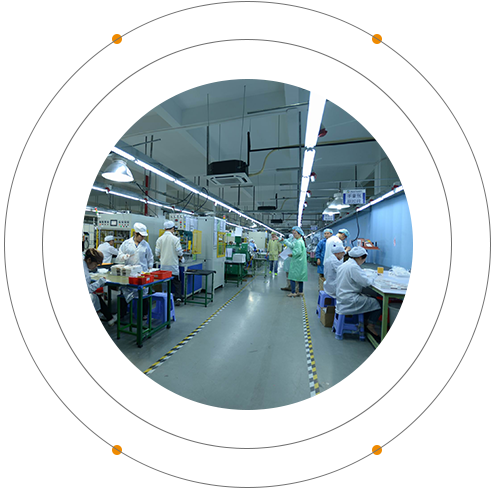 Exclusive production line We can arrange an exclusive area/line to serve as independent zone to fulfill customer's confidentiality requests.